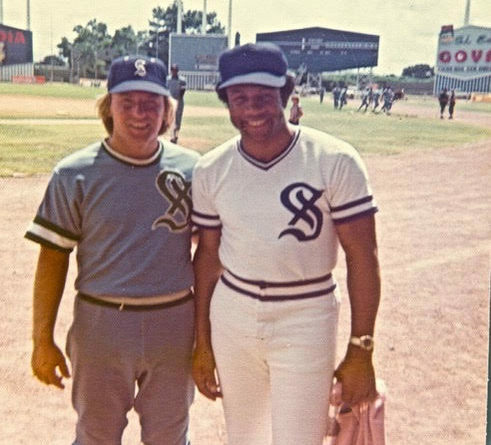 Doug Davis (left) of Windham poses with future Baseball Hall of Famer Frank Robinson during the 1974 season when they played for the Santurce Crabbers in the Puerto Rican Winter League. Davis and Robinson remained friends over the years. Robinson died Thursday at age 83. Doug Davis was a spare player for the Santurce Crabbers in the Puerto Rican winter baseball league. It was 1974. At his first practice, he manned left field during batting practice while the Santurce manager, future Baseball Hall of Famer Frank Robinson, stood in front of him watching batting practice. Davis, 75, knew all about Frank Robinson and decided to use his sense of humor in the hope of making a positive first impression. “We were wearing the uniforms from the year before, these horrible, thick, blue uniforms, and Frank came out in a brand-new uniform,” said Davis, a New York City native now living in Windham. “As I was running toward the [batting] cage to hit, I stopped and asked Frank if he was trying out for the team, too. “He said, ‘Because I’m better looking than you are. Now get lost,’” said Davis, who knew Robinson sensed he was joking with him. The men developed a friendship and Davis even received an invitation from Robinson in 1982 to attend his Baseball Hall of Fame induction where, he said, Robinson waved at him. Robinson, the only man in MLB history to win the Most Valuable Player Award in both the American and the National leagues, died Thursday at age 83. Robinson also held the distinction of becoming the first African-American manager when he was named the player-manager of the Cleveland Indians in 1975. He was still involved in baseball at the time of his death as he was working for Major League Baseball Commissioner Rob Manfred. “He was a great guy. He was just a regular guy,” said Davis, who has lived in Windham for 15 years. “He was a fun guy to be with. “Nobody loved the game more than Frank, and no one took it more seriously than he did,” he said. The last time Davis saw Robinson was in 2011 at Roberto Alomar’s Hall of Fame induction. Davis and Robinson were mutual friends of Alomar’s father, former major league Sandy Alomar Sr.
Davis said the induction was packed and the only way he could get near Robinson was to stand in line to get his autograph. He signed up to pay $25 to get a photo signed by Robinson, but he didn’t have one. However, Davis’ wife, Deb, had a uniform top that had been worn by Robinson. But it would have cost $250 to get it autographed. Davis said when he handed the uniform to Robinson for him to sign, the woman who was keeping track of the signings said he had only paid for an autographed photo. “Frank turned to her and said, ‘What’s wrong with you? Can’t you see that this guy is a friend of mine?’” Davis said. The men didn’t keep in touch regularly, but Davis knew Robinson always extended him an open door. “When Frank was with the [San Francisco] Giants and they came [to New York] to play the Mets, he let me suit up and throw batting practice,” Davis said. During that season in Puerto Rico, he and Robinson would occasionally go out to a bar after a game or spend time on the beach. “Once Frank trusted you, it was an open conversation. Nothing was hidden,” Davis said. Davis was a spare player who would only dress if one of the six imported players allowed on each Puerto Rican League team left or didn’t show up for the game. Davis said Robinson dealt with plenty of bigotry during his playing days, particularly in Cincinnati where he broke into the major leagues in 1956. In 1961, he was arrested for carrying a concealed weapon, a gun, when a cook in a restaurant threatened him with a knife. Davis said Robinson was with another black player, Vada Pinson, and the two of them just wanted to order sandwiches to take out. They were informed that African-Americans were not allowed to be served in that restaurant. Robinson told Davis he and other black players had to eat on the bus while their white teammates dined in the restaurant. “Frank told me if you were an African-American in the Cincinnati-Kentucky area, you had to carry a gun [for protection]. They had no use for black people in that community,” Davis said. Robinson told him he was much happier when he got traded to Baltimore in 1966. “Baltimore was much more liberal, and there were more blacks,” Davis said. Robinson was named the National League MVP in 1961 and earned the AL MVP Award in 1966, his first season with the Orioles. “All he cared about was winning,” Davis said.